Holaaa~ I've got two adorable and lovely guests from Oh!eaf over the poutandchow's crib two Saturdays back for our first collaboration: Lunch For One. So how do this collaboration come to flourish? I simply believe that it's all about fate (缘分). This anecdote goes all the way back in May, when I attended an event called "Green Is The New Black". I was strolling along the marketplace filled with independent designer brands and spotted a row of minimalistic, intricate and fine pieces of ceramic wares at a booth. I approached these two young designers and chatted quite a fair bit about how I love their creations and matches the imageries of my food styling direction. For all you know, the ceramic spoons I used in the last few posts were all their visions. They just moved into the opposite block where my parents live. That's pure coincidence. Through our long coffee talks at Starbucks, I was inspired by their humble devotion to learning, practicing, and adventuring to collaborate with like-minded young makers stationed in ceramic towns so as to preserve this beautiful art in a contemporary approach. As I very much love to keep things pretty, functional and crafty in my daily life, Oh!eaf is very kind and keen to sponsor their handmade pieces for a series of single serving meals that I will sharing in the upcoming months! Since summer is here, I want my lunch to be vibrant, colourful, and light to match the vibes. Japchae (Korean red potato noodles) is quite a recent addition to the noodles aisle in the supermarket, and I decided this fry it up with some thick, shiny, fresh grey prawns. Japchae or chap chae, is Korean sweet potato glass noodle, it is a signature Korean stir-fry dish that is commonly paired with vegetables in strips, sometimes with beef or squid added. The glossy appearance of Japchae has its unique chewy and slippery texture which makes it the distant relative of thick rice noodles (粗米粉）due to their similarity in thickness, and they slip off really easily if your chopsticks skill is not at an expert level. To enhance its nutritious value of being low in calorie and fat count, I've added two superfood powerhouses; leek and turmeric. Leek is an underrated health food which also has very much to offer like how its allium vegetables (garlic, onion) counterparts contain notable benefits fighting against diseases including cancer. Allicin provides an abundance of important attributes to the body, such as anti-bacterial, and anti-fungal activities, and reducing cholesterol by impeding harmful enzymes in liver cells. What I love about leek is when it softens over low heat in stews or soups, it becomes a natural sweetener. Why do we even need sugar now? On the other hand, turmeric is already an uprising star. It's a great herbal remedy for healing wounds with its anti-inflammatory, antioxidants properties. You can mostly spot them in curries and sauces in North Indian cuisines. By the way, just give you a heads up; protect your finger tips with a disposable glove or cloth while handling turmeric. As you can see my yellow fingers in the photos, I did not paint my nails yellow for summer, it was my negligence for not wearing gloves and I totally underestimated how rebellious turmeric stain can be. 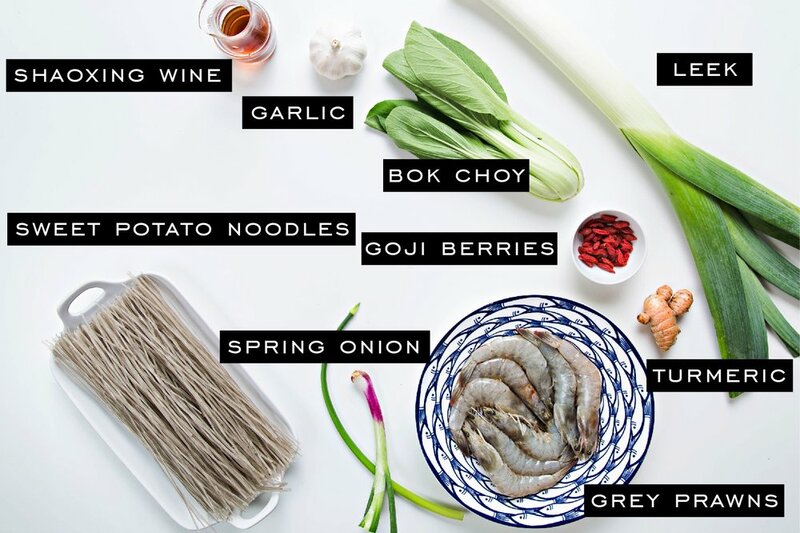 When both superb ingredients are combined, this Drunken Prawn Japchae becomes a simple, nutritious meal to bring to work/ or to end the work day with a light dinner. At the first bite, you may find that the noodles tastes a little bland, but hold on to your salt/soya sauce! Don't add them in straight away. It takes a few more slurps for the flavours to release and heighten. Just like for Chinese soups, we say 越喝越有味道 (the more mouthfuls we take, the more flavourful it gets) you'll never get enough of the quiet, mild taste that sits in your mouth. Pour boiling water over dry Korean sweet potato noodles in a bowl until it is fully submerged. Leave it to soften for 12- 15 minutes. Trim off prawn's antennae, rostrum, walking legs and cut open the back of the prawn to devein. Do not de-shell yet. Wear a plastic disposable glove and peel turmeric skin using a vegetable peeler. Cut turmeric root in fine julienne. Note: The flesh of turmeric root leaves a harsh yellow stain on your finger tips, knife and chopping board, wash them immediately after handling turmeric. Keep turmeric dry. Cut away roots of the leek, start slicing from the bottom white section diagonally. Dice spring onions and set aside for garnish. Chop garlic in fine chunks. Cut bok choy, separate stem and leaves. Heat up frying pan over medium heat, add olive oil, and garlic. Fry it for 20 seconds. Add prawns and fry each side of prawns for 1 minute or until it turns red. Once both sides are red, add goji berries and shaoxing wine. Lower to medium low heat, fry for 10 seconds and scoop the prawns up only to set aside, leave the red garlic sauce behind. Add leek and turmeric into the frying pan, cook for 8-10 minutes till leek has softened and coated in turmeric gold. Meanwhile, de-shell cooked prawns, and set aside. Pour in bok choy stems and fry with the mixture for 20 seconds. Then add bak choy leaves, cooked sweet potato noodles, prawns and fish sauce into frying pan. Add ½ cup of water (if you like it to be more saucy). Toss the mixture evenly using long wooden chopsticks for 3 minutes and season with white pepper to taste. Sprinkle spring onions and serve.